LASIK and the other surgeries described in this chapter allow us to set the focus of your eyes for excellent distance vision, excellent near vision, and anywhere in between. If you are under forty-five years old, we normally set the focus of your eyes for excellent distance vision. Because the natural lenses in your eyes are still flexible, you will also have good intermediate and near vision after surgery. If you are over forty-five, presbyopia is setting in. It is easy to give you excellent distance vision with LASIK and the other surgeries discussed preveously. The challenge is giving you good near and intermediate vision, too. There are several approaches we use to meet this challenge, which I’ll review in this section. The most common solution to presbyopia is monovision. In monovision, we correct one eye for excellent distance vision, and we set the focus of your other eye for close vision. To be more precise, the close eye can be set for either intermediate or near vision. If you spend a lot of time on a computer, we set the close eye for intermediate vision. If a computer is not a major part of your life, we often set the close eye for near vision, so you can read a menu in a dimly lit restaurant. Each of the procedures discussed previously can be used to create a monovision correction. Monovision sounds strange, but for many people it works very well. People with successful monovision see both far and close effortlessly; they can drive a car and read a menu in a restaurant without glasses. In many people, the brain is wired to automatically select the eye with better vision, so you aren’t even aware of which eye you are using to see at any moment. Monovision is similar to stereo sound, where each ear hears something slightly different, but the brain puts the information from the ears together into a single sound field. Monovision is great, but not perfect. With monovision, distance vision is not quite as sharp as having both eyes corrected for distance, but it is about 90–95 percent as sharp. You may notice the lack of perfect sharpness particularly at night, while driving, because there is less light. In that case we can prescribe a pair of glasses for night driving that correct your near eye for distance vision, but this is usually not necessary. Some people don’t tolerate monovision well. Perhaps they don’t like the slight sacrifice in clarity of distance vision. Others find that the brain doesn’t switch between eyes naturally or that having different vision in the eyes doesn’t work well for them. The key to successful monovision is testing you before surgery to see if you will like it. This testing can be done in the office with temporary glasses. With these glasses you can experience monovision before you have surgery. Monovision testing can also be done with temporary contact lenses. We place these contacts in your eyes in the office. You wear them for a few days, even while sleeping, and then we remove them. This allows you to experience monovision in the real world, outside the office. You see what it is like to drive, work on a computer, and read your cell phone or newspaper. Monovision correction can be achieved with LASIK, implantable contact lenses, or refractive lens exchange. Which procedure is the best way to achieve a monovision correction depends on the patient. Generally, for lower levels of correction we do monovision with LASIK. For higher levels of farsightedness we often use refractive lens exchange, and for higher levels of nearsightedness we often use implantable lenses. Monovision is a great solution for presbyopia for many people, but it is not for everyone. The other approach to treating presbyopia is refractive lens exchange with advanced lens implants. With refractive lens exchange (RLE), we remove the natural lens and replace it with an improved synthetic lens that provides a better focus for your eyes. One of the great benefits of RLE is the ability to use advanced lens implants. These are implants that can correct presbyopia. There are two kinds of advanced lens implants: multifocal implants and accommodating implants. Most lens implants have a single focal point, for either far or intermediate or near vision. These are called monofocal lenses. You get clear vision at one of these three distances, but only one. Multifocal implants (Figure 15) are designed to give you clear vision for both far and near. A series of concentric rings on the lens bends light to create two focal points. With a multifocal lens you can watch TV and read a menu without glasses. In a sense, a multifocal lens is a bit like bifocal glasses because it allows both distance and near vision. The multifocal lens is better than bifocals in one very important way. One of the most annoying things about bifocal glasses is the need to carefully position your head and eyes in order to read. With a multifocal lens you can read well with your head in any position, looking in any direction, even looking up. For many people, multifocal lenses are a great option. However, there are two compromises with these lenses. The first is that distance vision is not quite as sharp as with a monofocal lens because only half of the incoming light is focused perfectly for distance (the other half is focused for reading). For most people, the vision is still so much better that this is an acceptable sacrifice. The second compromise is that the rings on the lens that create the bifocal effect cause rings around headlights and streetlights at night. These rings are noticeable but only rarely bothersome. For those who want the sharpest distance vision, or don’t want rings around lights at night, an alternative to a multifocal lens is an accommodating lens. Accommodating lenses are soft and flexible, like your natural lens was before you got presbyopia. These lenses flex in the eye, allowing the eye to change its focus. Accommodating lenses provide a greater range of vision than standard lens implants, but the current accommodating lenses are just not flexible enough to provide great near vision. The near vision with accommodating intraocular lenses (IOLs) is not as clear as it is with multifocal IOLs. You may find that you are somewhat confused about what is the best vision correction option for you. Don’t feel badly. It takes the average eye doctor the first six months of his or her training to understand the various procedures described above. If you are over forty-five years old, and likely have presbyopia, I would suggest that you read this chapter twice. Then, take your questions to your eye surgeon and have him or her explain how the general information presented here applies to you. The bottom line is this: you should go into your vision correction procedure understanding what can be done to optimize your close vision after surgery and for the rest of your life. Figure 15. A multifocal lens, shown here inside the eye after surgery, has a series of concentric rings that allow for both far and close vision without glasses. 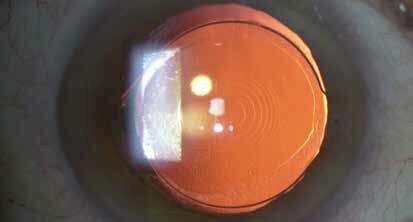 Once inserted, the implanted lenses are not visible to others.